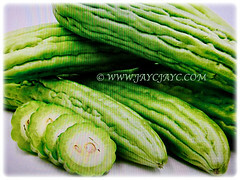 Bitter Gourd or Bitter Melon is a climber with distinctive and delicate leaves that produces exotic and bitter fruits that are often cooked as a vegetable. Since Bitter Gourd contains numerous medicinal properties, it is considered as a versatile plant that’s worthy of treating almost any disease inflicted on mankind. Botanical Name: Momordica charantia (syn. : Momordica elegans, Momordica chinensis, Momordica indica, Momordica sinensis). Common Names: Bitter Gourd, Bitter Melon, Bitter Squash/Cucumber, Balsam Pear, Peria in Malay. Origin: Native to tropical and subtropical Africa and Asia, including India. Plant type: An ornamental vine that produces fruit that’s cooked as a veggie. Features: Momordica charantia is from the genus Momordica that consists of about 60 species of annual or perennial climbers. A fast-growing climber that grows up to 5 m long. 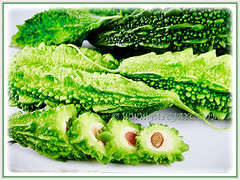 Its green leaves are simple, palmately-veined with 3-7 deeply separated lobes. Besides, it has variable notches along the margins. It has a twining growth form and climbed with the help of tendrils. The 4-12 cm leaves are alternately arranged along the stem. It is monoecious with unisexual flowers that are located axillary. Showy flowers are solitary and yellow or golden in colour. Its ovate-elliptical to elongate-fusiform fruit is a pepo and has a surface that is covered with ridges, wrinkles or spines. It is hollow in cross-section, with a relatively thin layer of flesh surrounding a central seed cavity filled with large, flat seeds and pith. The immature fruit is green with white seeds that are covered with stiff seed coats or testae. Each seed is 1-1.5 cm long. 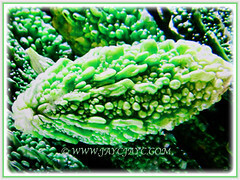 Fruits are usually harvested when coloured green or slightly yellow. Mature fruit will turn from green to yellow and orange with a bumpy or tuberculate texture. 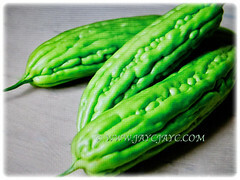 There are two varieties of Bitter Gourd, namely the Chinese variety and the Indian variety. Chinese Bitter Melon is longer and larger in size, measuring 20-30 cm long and 5-7.6 cm in diameter and less bitter. On the other hand, the Indian Bitter Melon is much shorter and smaller in size with pointed ends and a rough skin and dark green colouration and definitely more bitter. 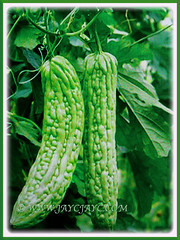 Culture (Care): Momordica charantia or Bitter Gourd can be grown easily with least maintenance. Light: Best in full sun for optimum growth and fruit production. Moisture: Moderate water requirements. It benefits from occasional misting. Avoid overwatering as it’s prone to rotting. 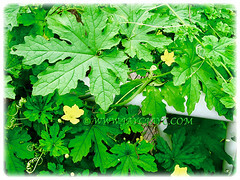 Others: Being a climber, Bitter Gourd requires a trellis to support its growth for high yield and quality fruit production as well as to avoid rotting when in contact with moist soil. To increase fruit production, remove the side branches and allow the climber to reach the top of its support structure and let it spread. Generally free from serious pests and diseases. Nevertheless, watch out for fruit flies, powdery mildew, downy mildew, fusarium wilt, target leaf spot and root-knot that are caused by nematodes. Further reading on control measures to be taken. 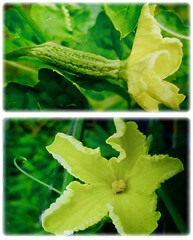 Momordica charantia or Bitter Gourd is a tropical and subtropical vegetable crop that produces tendrils for climbing. In colder climate, this fast-growing beauty with edible fruits is grown as an annual. For propagation, sow 2-3 of its seeds directly in your selected sunny location after last frost and germination should appear in about a week. Then, use a trellis to support this climber. Feed once fortnightly with a fertiliser designed for fruiting vines. If necessary, mulch to conserve soil moisture and prevent weed growth. Bitter Melon should be harvested regularly to encourage the healthy growth of new fruits. 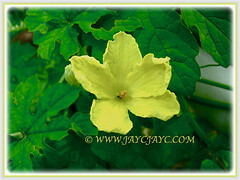 Usage: Momordica charantia or Bitter Melon, a vine with ornamental flowers and fruits will be excellent for a trellis, arbour or pergola. 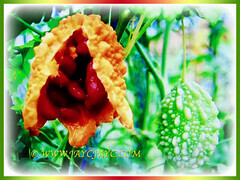 Plant it in a small economic garden to enjoy its fruits all year round. The immature fruits are often cooked and eaten as a veggie. 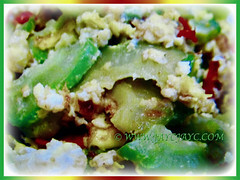 A popular dish is to stuff the rings of the fruit with paste of pork, fish or shrimp and steamed, after removing its seeds and pith. All its fruits, flowers and young shoots are edible. You can also enjoy the tropical appearance it adds to the landscape. It contains many medical properties. Its juice is applied externally to treat skin disorders such as psoriasis and its juice is drunk as a cure for arthritis, rheumatism and asthma. Besides, research has shown that the immature fruit might have some antibiotic, antimicrobial, anticancer and antiviral properties, especially well suited for use in treatment of ulcers, malaria, HIV and diabetes.